Gaywool Dye may be used on all fibers and fabrics, but originated on a sheep farm in Australia, similar to ours. Stone Mill BBQ & Steakhouse offers $11.99 all-you-can-eat catfish all day Mondays. At Bros Houligan Get $2 off chicken tenders on Mondays. 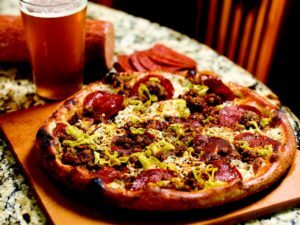 Upper Crust Wood Fired Pizza offers $20 pizza and pitcher of beer from 4 to 6:30 p.m. every day from 4 to 6:30 pm everyday. Rusty Crane is offering roasted pork taco plate and margarita are $5 each on Mondays. 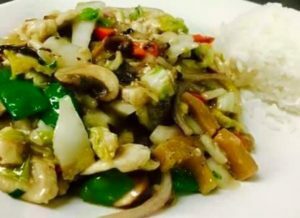 Ming’s Noodle Bar offers $5 moo goo gai pan with drink purchase all day Monday. The Brook offers $6 cheeseburgers with fries on Mondays. 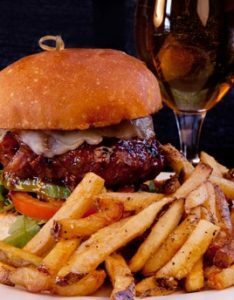 Baxter’s Interurban Grill offers $6 Honey Pepper Bacon Burgers all day Monday. Georges Pub is offering pork sandwhich’s for only $6.50 on Mondays. Deep Eddy Lemon and iced tea. Savastano’s $8 one-topping, 14-inch pizza to eat In the restaurant or to carry out Mondays. Georges Pub is offering 1/2 price wings on Mondays. Upper Crust Wood Fired Pizza offers $25 pizza and bottle of house wine from a special list from 4 to 6:30 pm everyday. The Pint On Cherry Street has 50 cent wings all day on Mondays. Rusty Crane is offering Dr. Don’s beef taco plate or roasted pork taco plate and margarita are $5 each on Mondays. • Sheep & Shepherd Tours begin when the lambs are born each spring (beginning in mid-March) at Shepherd’s Cross – an authentic working sheep farm, just north of Claremore OK on Scenic Route 66. • Come to the farm and watch as the sheep peacefully graze the pastures, and rest by the still waters. • Watch the new born lambs jump for joy & frolic in the pastures. • Shepherd’s Garden is bursting with blooms in the spring – as seen with guided, self-guided or audio tours. • Preschedule Field Trips for groups & schools. Groups of twenty or more please pre-register. • Donation based – suggested $5.  Wagon Ride Tour – Take a wagon ride out in the pasture and see the flock up close. Experience the shepherd’s perspective of the flock. • $7 per person – one free leader for every 10 paid participants. • Wool Mill Guided Tour – wool is processed on site – combed, spun, and woven into a finished product. • Visit the sheep and other farm animals at the barn petting area. • Tour the educational & interactive Farm Museum & Educational Silo – guided or self-guided tours. Watch up close the mama ewes & baby lambs from the silo during lambing season – a “bird’s eye” view. • References to nomadic shepherds and Biblical shepherding.  Guided Tour with a take-home project; $7 per person – one free leader for every 10 paid participants. • Picnic area is available; bring your lunch with you; limited seating. • Snack and beverage concessions are available on site. • Tours can proceed even in the case of inclement weather. Demonstrations will take place in the Amish built gambrel roof tour barn, which houses some of the animals as well as the wool processing, farm museum, and the gift shop. • Shepherd’s Shop features a host of “woolly” and farm related (handmade at Shepherd’s Cross & consigned) items; supplies and much more! Additionally the shop features a mission section; purchases made in this section of the store return 100% of the sale price to the indigenous people that crafted them (countries include Afghanistan, Thailand, Kyrgyzstan, Malawi, Uganda and more). • Shepherd’s Cross is an accredited Agritourism facility, a Made in Oklahoma Company, and is Animal Welfare Approved (pasture born & raised). • Shepherd’s Cross features farm fresh, Animal Welfare Approved, pasture raised, free range, chemical free American sheep meat (lamb & mutton) and Dexter beef. • Yarn, yarn, & more yarn – natural, many types, produced and processed on the farm. Shepherd’s Cross also offers roving, batts, felting supplies, knitting needles, spinning and weaving supplies and much more. Animal welfare Approved wool. • Fiber Arts, Animal Husbandry & American Sheep Industry Certified Shearing classes are available at the farm throughout the year. • Heart of the Shepherd, a 501-C3, provides the educational tours. Teaching basic agricultural principles and agricultural references to the Bible are a part of each tour. Roka Bar & Asian Flavors offers $5 burgers every Monday. Our menu features made from scratch Asian dishes carefully crafted from Oklahoma bounty that come out freshly plated every single time. Our success depends on your satisfaction, and we aim to deliver the cleanest, freshest, most approachable Asian cuisine in the Tulsa area. From our service to our our ambiance to our attention to detail, a meal at Roka is unlike any other in the city. Stillhouse Bar & Grill offers $1.50 Chili Cheese Dogs every Monday from 2-11pm. Señor Tequila on Brookside offers $0.99 Bud Light drafts daily from 3-6pm for happy hour. Señor Tequila at The Mill offers $0.99 Bud Light drafts daily from 3-6pm for happy hour. Señor Tequila at Plaza del Sol offers $0.99 Bud Light drafts daily from 3-6pm for happy hour. The Cigar Box in Broken Arrow offers $1.50 Domestic Drafts & Bottles everyday from 4-7pm. The Cigar Box in Jenks offers $1.50 Domestic Drafts & Bottles everyday from 4-7pm. The Cigar Box in South Tulsa offers $1.50 Domestic Drafts & Bottles everyday from 4-7pm. Prhyme Downtown Steakhouse offers $2 tacos from 4-6 daily. 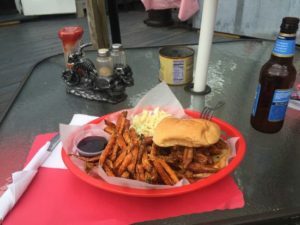 Smoke On Cherry Street offers $5 cheeseburger and fries, 4 p.m. to close Mondays. Sisserou’s Restaurant offers 1/2 off select appetizers Mon-Sat from 4-6pm. Baxter’s Interurban Grill offers 1/2 price appetizers during Happy Hour. Monday-Friday from 4-7pm. The Pint on Cherry Street offers 1/2 priced appetizers for happy hour Monday-Friday from 4-6pm. Smoke Woodfire Grill offers a 1/2 Priced Appetizers Mondsay through Friday from 4pm to 6pm. Doc’s Wine & Food offers happy hour specials from 4 to 6 pm everyday. KEO on Brookside offers 1/2 price small plates Monday-Saturday (at the bar only) from 4:30 to 7pm. KEO on Yale offers 1/2 price small plates Monday-Saturday (at the bar only) from 4:30 to 7pm. The Pint on Cherry Street offers $0.50 Wings every Monday from 5pm-Close. Yokozuna offers $1 steamed buns Mondays after 5pm (dine-in only). Choose from pork, sriracha chicken. 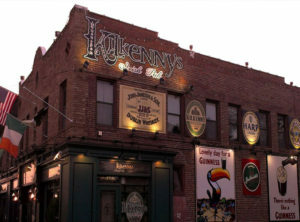 Kilkenny’s offers $6 Butter Slip Burgers, Fish & Chips, and Wings every night from 10pm-12:45am. Pie Hole Pizzeria offering 12-inch gourmet pizza for $10.99 on Tuesdays. Pie Hole Pizzeria offers a 16-inch, two-topping pizza all day Tuesdays. Stone Mill BBQ & Steakhouse offers $13.99 all-you-can-eat ribs all day Tuesdays. At Bros Houligan Get $2 off T-bone steak on Tuesdays. The Sushi Place offers $3 crunch roll on Tuesdays. 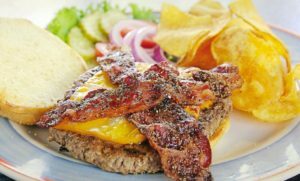 Crow Creek Tavern offers $4 half pound burgers all day Tuesdays. The Brook offers $4.50 half order of nachos on Tuesdays. Full Moon Cafe offers three tacos for $5 on Tuesdays. Ming’s Noodle Bar offers $5 Pad Thai all day Tuesdays.